The term bile is used to describe the solution that is excreted from hepatocytes into the bile ducts and then stored in the gallbladder. When needed the bile is released into the duodenum. The main component of the bile is water (> 80%) in which various substances are solved. The viscous nature of the bile is mostly due to electrolytes and special glycoproteins (mucine). Special lipids, bile acids, phospholipids and cholesterine help with the physiological functions of the secretions. Besides that, bile contains various excretory products of the body, hormones and bilirubin, which gives the liquid ist brown-yellow coloring. Sugar is not a physiologic part of it. In case any sugar is present in the bile it is called glycocholia. 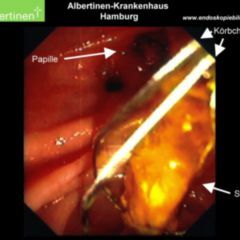 Right after its production in the liver and secretion into the bile ducts, the bile has low viscosity and yellow colour (hepatic bile). 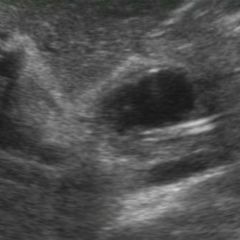 Then it is collected via the hepatic duct and if the sphincter of the hepaticpancreatic ampulla is contracted, transported to and then stored in the gallbladder via the cystic duct. 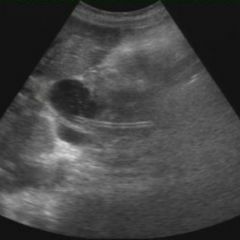 In the gallbladder a concentration increae of up to ten times by removal of water and ions (particulary chloride) is performed (bladder bile). In addition to a minor continous secretion of bile into the lumen of the duodenum, hormones (for example cholecystokinin) stimulate the gallbladder to contract and through that lead to the increased secretion of the viscous bile. 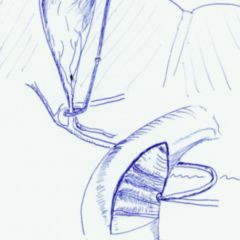 A premature secretion of bile into the common bile duct (for example in the case of increased intraabdominal pressure during defecation) is most likely prevented by the cystic duct and the there present Heister’s valve. In the duodenum the amphiphilic lipids in the bile, especially bile acids and phospholipids , form micelles with the fats taken up from the nourishment and the fats from the intestine that were cleft by lipases. These micelles are necessary to make the resorption of lipid in the intestine possible. 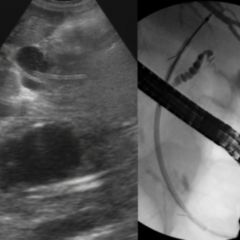 In the distal part of the ileum the bile acids are again removed from the intestinal lumen and are transported through the so called enterohepatic circulation. Following the portal circulation they are transported back to the liver where they are once again can be used for the digestion of fats. In addition the bile fluid is an important liquid through which the execretion of metabolised hormones (in particular steroids) and the haemoglobin remnant bilirubin can be achieved. In case of a to high concentration of cholesterine (for example hypercholesterolemias) or bilirubin (for example haemolitic anemia) in the bile fluid, their solubility coefficient is exceeded and because of that precipitation of substances in the bile ducts takes place. The consequences are concrements in the bile ducts which in severe cases can lead to cholelithiasis.